There seems to be a lot of confusion around coils and resistors so here is my attempt to clarify. With a Pertronix, you have to run the resistor with either the stock or red coil but must bypass the resistor with a "blue" coil. If you run without a resistor with a coil that requires one, you run the risk of frying the Pertronix because it may not be able to handle the higher current draw. You can also overheat the coil itself. If you use a resistor with a blue coil, you'll get much weaker sparks but your points will last longer. Why did BMW use an external-ballast-resistor coil, anyway? On all North American '02s (at least from '72-on), BMW fitted the "heavy duty" ignition system that was apparently an option for carby '02s in other markets and standard on tiis and turbo. According to the factory specs and part numbers, the tii and carby external-resistor coils are the exact same part. Essentially, the "external resistor" coil is just a coil that is designed to work properly when supplied with about 9 volts. It is then used with the external ballast resistor so it can safely operate continuously when supplied with the usual 13-14V available when the engine is running. Since a coil's current draw is directly related to the amount of spark energy it might deliver, more current is naturally better except that a coil's current has to be limited to an amount that would not make it overheat in continuous use and/or burn out the points prematurely. But why bother with the external resistor? For normal running, it would be electrically equivalent, cheaper, and more reliable to use a coil designed for the actual system supply voltage and ditch the resistor entirely. The answer is that the whole point of the external resistor setup is to be able to maintain or even boost spark energy during starting, when the system voltage is often pulled way down (under 10V with a marginal battery) by the starter motor and the sometimes very uneven, way rich or lean mixtures are much harder to ignite. By using a coil designed for a lower supply voltage, the designers could then essentially "over-drive" the coil during starting by bypassing the ballast resistor and feeding the coil directly with whatever the battery had to offer. But because the resistor is only bypassed during cranking, the coil would not have much chance to overheat and the points life would not be too adversly affected by a few seconds here and there of switching the much higher current. On earlier '02s with a ceramic-block ballast resistor, there is a relay near the firewall that does the bypassing based on a signal from the circuit that energizes the starter solenoid. On '74 and later, they simplified the design and eliminated the relay, instead supplying battery voltage directly to the coil via a second, smaller spade terminal on the starter solenoid (which is itself a relay anyway). Also on '74 and later, the obvious ceramic resistor was replaced by a sneaky, "special" resistance wire that runs in the harness from somewhere over the engine to the coil's positive terminal - it has clear insualtion and a moulded marker at the coil end with the resistance value on it (by now those are usually just a blob of crispy rubber). All resistors for all years were 1.8ohms, according to the factory manual. Just had a quick look at my manual again and noticed some damn footnotes beside the coil and resistor specs. Seems earlier actually had 0.9ohm resistors but I cannot tell when the cutoff was. If so, that also means the coils were probably different. I still stand by my contention that the stock ignition system with an external resistor coil is the equal of a "red" coil. The only thing is that if you add a red coil or a later "stock" coil to an early car with a 0.9ohm resistor, you will have to replace it with a 1.8ohm or add 0.9ohm. If you run a blue coil and do not bypass the ballast resistor, you will only get full power when starting and much less spark energy when running. A blue coil is actually a downgrade from stock since there is no more "boost" ability during cranking. But, on a well tuned car with a good battery, it may never matter. As mentioned above, if you run a stock or red coil without the resistor, you run the risk of overheating the coil, burning out your pertronix, or going through a lot of points. I have heard some people say red coils work just fine without resistors but I have a hunch they have later cars that have the sneaky resitor wire and they are running them correctly without realizing it. Other aftermarket coils? I dunno - you have to look at each one's specs. You have to be sure the coil you use will not draw too much current for the ignition system you have - points, pertronix, or crane. If you add a resistor, make sure you are not inadvertantly adding it to the stock one or disabling the starting boost feature - it could make all the difference one cold day. Aaron Heinrich Asks Out of curiosity, what specs on the coil do you look at to determine what is "superior"? If we know what the specs on the stock, blue and red coils are, we should be able to get the pertinent information on aftermarket coils to make an educated decision, presumably. The most useful performance spec would be "total energy" or "energy storage", basically a measurement in Joules or Watt/seconds. The most commonly seen specs are maximum spark voltage and primary resistance. Max spark voltage can be misleading since you can have high voltage with no current and thus no energy behind it (the actual spark voltage is determined mainly by the plug gap, anyway). Primary DC resistance is just an indirect way of getting at the primary current draw but seems to be what is most easily measured and thus is most often stated. The actual current draw in use is dependent on the inductance of the coil, but nobody knows what to do with that. Primary current draw is usually proportional to energy storage so you can maybe use that for comparison, but a bad coil design could draw a lot of current and not make much spark, too. Type E(Black)6V-12V systems for 4 cylinder engines. No resistor needed. Output 13.5 KV. This was the type commonly found on small 4 cylinder engines i.e. Volkswagen, etc. Type K(Blue)6V-12V systems for up to 6 cylinder engines. No resistor needed. Output 17.5KV. This was the type commonly found on 6 cyl VW and as a performance upgrade for 6V systems and lower power 12V systems. Should never be used on BMWs. Type KW(Black) 12V-24V systems for up to 6 cylinder engines. Output 22.5KV. For 12V operation use ballast resistor 0.6-1.0 ohms, for 24V operation use ballast resistor 4.5 ohms. This is the coil that came standard on all BMW engines. As you can see going to a Blue coil would be a significant step backwards. Type KW(Red) 12V systems for up to 8 cylinder engines. Output 26.5KV. Use with 1.4-1.8 ohm ballast resistor. If the ballast resistor is omitted, the points will burn up very quickly. If a transistor trigger is used, then a ballast resistor is not required. When a resistor is required, it should be placed in series with the igniton hot (12V) lead. It should be mounted with a heat sink since it will get quite hot. All induction coils actually contain two wire coils, a primary and a secondary. The primary coil contains a few hundred turns of thick copper wire. Since the wire diameter is large and the wire is short, the ohm reading is very low 0.8-1.4 ohms and the coil will conduct a substantial amount of current to the points. Current flow to the points is a function of voltage, coil wire resistance and points closed dwell time. More than about 4 amps will usually destroy a set of points. The secondary coil contains 15000-30000 turns of very thin copper wire. Since the wire is thin and very long, the resistance is high, usually about 12-18KOhms. Thats a thousand times more than the primary side. While the secondary coil does not flow high current, it does produce a very high stepped-up voltage necessary to jump gaps in the cap and spark plug gap. Hopefully, this will settle the discussion regarding coils. 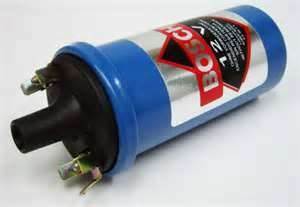 For those who would like to know a great deal more about induction ignition systems, the best text is a training phamplet by Bosch called: "Battery ignition systems" part number VDT-UBE 120/3 En. It covers not only point type ignition but also transistor and CDI type ignitions. After reading the text throughly, you'll agree most information about ignitions is mere marketing hype. The difference between the red and OE coils is probably pretty small in practice since the actual firing voltage when things are working right is under 15Kv, IIRC - I'd put the money elsewhere if my stock coil was otherwise OK. Too bad there is no info on the actual energy storage of the various coils. Even the blue coil might not be as bad as it seems. It looks like the OE coil was essentially the "red" for the last years, at least according to the BMW blue 2002 manual I have. I think there should be a caveat on the statement "[for the red coil] If a transistor trigger is used, then a ballast resistor is not required". I am pretty sure that applies only to the external Bosch ignitor modules (like what came on an e21 320i) but NOT ones like Pertronix. Bosch ignitors are internally current-limited (or just have a beefier switching transistor) where Pertronix ignitors are not able to handle the higher current. At least, the OE and red coils have primary resistances that are lower than Pertronix's minimum spec. so one would be risking it to run an OE or red coil without a resistor. In contrast, I know that some of the Bosch ignitor modules are smarter than that and feature constant, optimized dwell time and will even shut off the coil current after a few seconds if the ignition is on but the engine is not actually running (thus not overheating the coil or themselves). Just wanted to personally thank you - without your post I doubt my car would be running today. Here is how I installed a Crane Cams XR3000 ignition and PS91 coil in a 1976 carbed 2002. Before this installation, I had little experience with automobile ignition/timing, so I found the available guidance difficult to use. I bought the Crane XR3000 because I wanted the closest thing I could get to true electronic ignition, using a system that would bolt-on to my dizzy. I bought the Crane PS91 coil because the manufacture recommended replacing the OEM coil for the XR3000 application. I waffled between the PS60 oil-filled coil and the PS91, finally deciding on the PS91 due to slightly better performance specs and not much price difference. I relocated the coil location to the passenger firewall adjacent to the dizzy. I did this for several reasons. First, I needed to drill new holes to mount the non-OEM coil, and for rust prevention, I didn’t want to breach the wheel well. Also, the new coil location eliminated the various ignition wires that dangled along the side of the engine bay. Finally, the XR3000 wires would not have reached the OEM coil location unless I mounted the XR3000 along the side firewall, and I didn’t want it there. One coil-related surprise was the PS91 has a male coil-wire connection, while the OEM coil is female. Luckily I found a parts store with a M-F ignition wire in stock. Another coil-related surprise was the PS91 has slot connectors rather than post connectors. So I basically had to cut the ends off all the ignition wires and wire-nut everything to new coil slot connector wires. I might clean that up and get a couple of 4-prong connectors to eliminate the wire nuts. The installation would have been faster if I bought the PS60 and installed the XR3000 on the sidewall between the coil and the dizzy. The XR3000 is light enough that it can be screwed to the sidewall with 2-screws in an upper area that will not breach the wheel well, I think. The down-side with this arrangement is mainly aesthetic in that it dangles a lot of wires along the side firewall. My arrangement is cleaner looking. However, I spent more time monkeying with the wiring and the mounting locations than I spent actually installing the XR3000 in the dizzy. If you want a faster install with less wiring mods, go with the PS60. Following the example of a few FAQ folks, I mounted the XR3000 in the ventilation well above the new coil location. OEM ignitions have a resister in one of the coil power wires, either wired as a standalone unit mounted near the coil, or in the later models, as a resister wire. You must bypass the resister for an XR3000. The insulation on my resister wire was horribly failed and melted looking, with exposed conductor everywhere. I was more than happy to chop that out of the system. It was about 1 meter long and I replaced it with standard multi-strand wire using a soldered connection. The XR3000 includes generic directions and a little bag of cheap-looking adaptors to make it compatible with any 12-volt dizzy under the sun. That results in a lot of trial-and-error to figure out how it fits an 02. I thought I had this issue licked because another post on the FAQ board showed 02 installation instructions with photos. Unfortunately, neither the base arrangement nor the disk-type documented in that post worked with my dizzy. I wasted many hours trying to make that arrangement work, so beware, unless your dizzy looks exactly like mine, you may have to do something entirely different. 1. Remove the car battery cables. 2. Set the engine position so the #1 cylinder is at TDC. To do this, remove the valve cover. Push the car in 3rd gear to turn the engine until the slot on the timing chain cog is at the apex. Take the car out of gear for the remainder of the installation, so you don’t accidentally rock the motor out of position. 3. Remove the dizzy from the engine. Otherwise, it is next to impossible to install the tiny parts and check clearances of the shutter disk and optical sensor. To remove the dizzy, loosen the collar-pinch-bolt and pull the dizzy straight up. 4. Remove the points, condenser and wire grommet. 5. Install the base and sensor mount as shown in the photo. You will likely fine tune the mounts later, but the photo is a good starting point. 6. Find shutter-disk Part 220. Slip the optical sensor over the disk, then push the disk down over the dizzy post, noting that notches in the disk collar fit into the flat sections of the post. 7. Adjust the angle of the base and the height of the sensor mount to allow the dizzy to spin with the Crane components centered and not rubbing anywhere. Do this check with the rotor installed, since the rotor must clear the sensor as well. 8. In lieu of the electronic static timing described in the mfgr instructions, I timed it mechanically as follows. I did this without the dizzy installed so I could look closely at the tolerances. Point the dizzy post notch to the #1 TDC notch in the dizzy housing. Rotate the optical sensor mount so the leading edge of a disk slot aligns with the centerline of the sensor, then secure the mount in this position using the set screw. 9. Put the dizzy back on the engine and rotate it so the rotor points to the #1 TDC notch in the dizzy housing. This should be all you need to do to statically set the timing. 10. Button everything up. The timing should be close enough to run the engine. You will need to time it with a timing light for optimum performance. The 02 immediately started up on the first try following my XR3000 installation. It has never cold-started so nicely. Cold-starts with this car previously took over 10 tries.